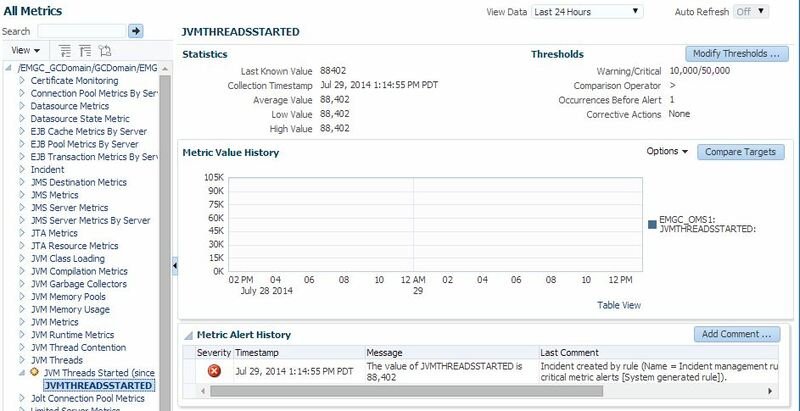 A few weeks ago, someone asked on the OTN forums how to alert on some of the JVM metrics such as ‘JVM Threads – Threads Started (since startup)’ using Enterprise Manager 12c (EM). This is one of those few metrics that EM collects, but does not allow custom thresholds. 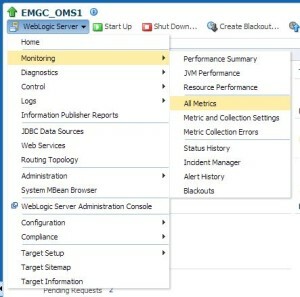 Let’s take a look at the metrics that EM collects on the WebLogic Server target. From here we can scroll down to the JVM Threads section and find the real-time data (by click on the category JVM Threads). The real-time data is not stored in the EM repository. Let’s continue to drill down by clicking on the specific metric, JVM Threads – Threads Started in this case. This shows us the data as of the last collection, the chart shows the history, and if you click on the link Table Data you’ll get a nice chart with timestamps and values. Now let’s take a look at the Metric & Collection Settings page to see what the thresholds are set at. On the Metrics tab, click the view drop down and select All Metrics, and scroll to the JVM Threads section. As you can see there’s no threshold setting for JVM Threads – Threads Started (since startup). In fact, you can not add a threshold to this particular metric. Why not? Who knows. But that’s not going to stop us. 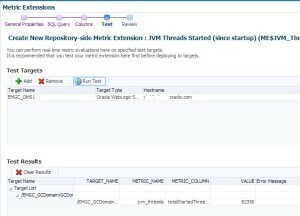 At the time I the only option was to create a Metric Extension to collect this data from the JVM and then store it as a metric and set your thresholds. I referred to one of my previous blog posts showing how to create a Metric Extension on Fast Recovery Area. With the release of EM 12.1.0.4 you can now create a Repository-side Metric Extension to alert on the already collected data! This Metric Extension uses a query to pull data from the repository, and then you can manipulate that as needed. No more re-collecting data just to trigger an alert! On the Metric Extensions page, select Create / Repository-side Metric Extension. Select the target type, in this case we select Oracle WebLogic Server. Enter a metric name, display name. and adjust collection schedule. Since our metric we’re going to use is collected every 30 minutes, we’ll use that schedule as well. Click Next. Next you will enter the SQL to obtain the metric. This is where your EM Repository skills will be put to the test. The following query will find the current (last collected) metric information for the WebLogic Server target type and the specific metric we are interested in. Be sure to read the tips and examples on the right side for more detailed queries. Click Validate SQL to verify, and click Next. 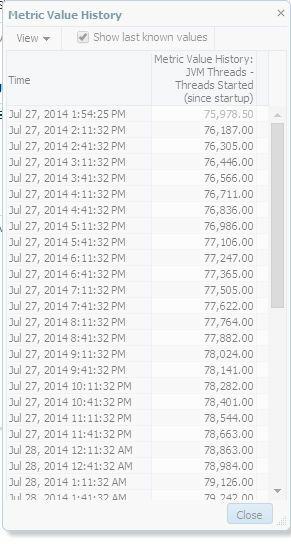 EM will pre-populate the required columns based on the query you provided. If you select the row JVMThreadsStarted and click Edit, you can now set a category or set default thresholds. This particular metric may not be a good example for default thresholds as it could be very target specific. In this example, we will go ahead and set the defaults. If you don’t set thresholds here, you can add them at the target level. After editing click OK and then click Next. Next we have the chance to Test our metric against a selected target. Click Add, select a WebLogic Server, and click OK. Then click Run Test. You will then see in the bottom pane, the results of your metric test. Verify that your results are as expected, and click Next . You’ll be presented with a Review screen before clicking Finish to complete your Metric Extension. Once created, select your Metric and click Actions / Save as Deployable Draft. Then select Actions / Deploy to Targets and select a test target or two that you can deploy to. Once you’ve tested successfully, select Actions / Publish Metric Extension and start adding your metric to templates. 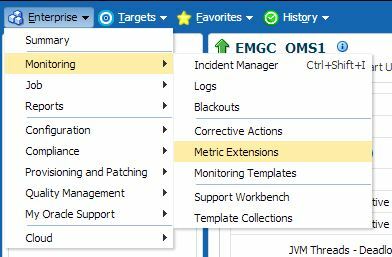 By going back to the Oracle WebLogic Server target I deployed to, and viewing Monitoring / All Metrics, I can now see my Metric Extension and that it’s already generated a Critical threshold violation. Be patient, it may take a few minutes to update the status once metric is deployed. 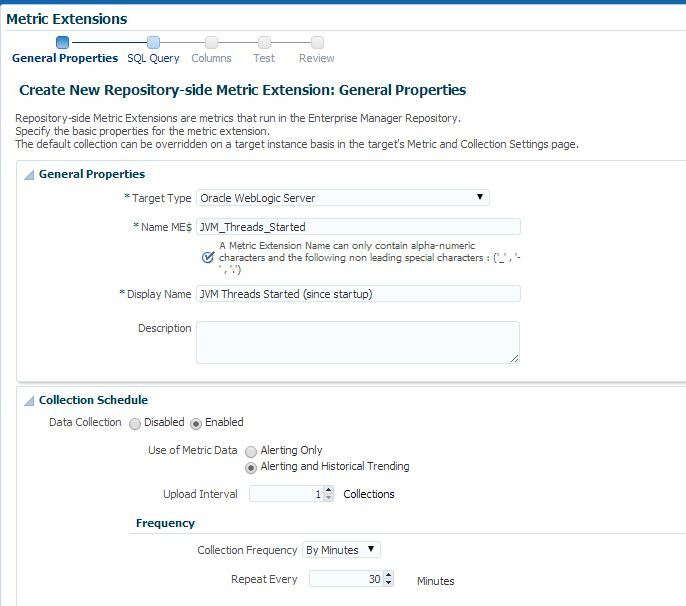 If you’re not on 12.1.0.4 yet, you’ll need to create a Metric Extension and select target type Oracle WebLogic Server, and use a Mbean browser to find the metric you’re interested in. In this case, the Metric = java.lang:type=Threading and the Column Order = TotalStartedThreadCount. 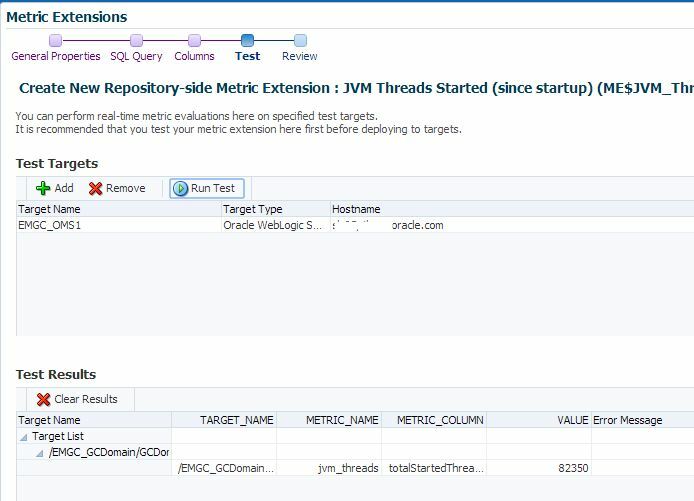 For more details on using Metric Extensions and their life cycle, see the Enterprise Manager Cloud Control Administration Guide section on Using Metric Extensions. Stop by and visit me at the Enterprise Manager demo booth, or come to one of my sessions! When planning and configuring your Oracle Enterprise Manager 12c implementation, you will have many infrastructure considerations. One of the most often discussed pieces is the network ports that are used and how to configure load balancers, firewalls and ACLs for communication. This blog post will help identify the typical default port and range for each component, how to identify it and how to modify the port usage. 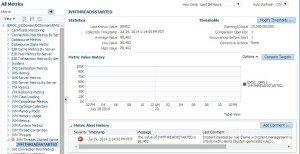 One of the most critical events to monitor on an Oracle Database is your archive area. If the archive area fills up, your database will halt until it can continue to archive the redo logs. If your archive destination is set to a file system, then the Archive Area % Used metric is often the best way to go. 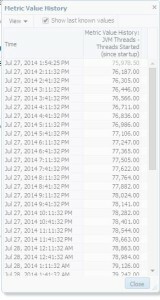 This metric allows you to monitor a particular file system for the percentage space that has been used. However, there are a couple of things to be aware of for this critical metric. If you are using Fast Recovery Area (FRA) for the archive destination and the destination is set to USE_DB_RECOVERY_FILE_DEST, you may notice that the Archive Area % Used metric does not trigger anymore. Instead you will see the Recovery Area % Used metric trigger when it hits a Warning threshold of 85% full, and Critical of 97% full. As this metric is controlled by the server side database thresholds it cannot be modified by Enterprise Manager (see MOS Note 428473.1 for more information). Thresholds of 85/97 are not sufficient for some of the larger, busier databases. This may not give you enough time to kickoff a backup and clear enough logs before the archiver hangs. If you need different thresholds, you can easily accomplish this by creating a Metric Extension (ME) and setting thresholds to your desired values. 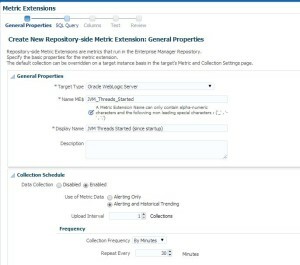 This blog will walk through an example of creating an ME to monitor archive on FRA destinations, for more information on ME’s and how they can be used, refer to the Oracle Enterprise Manager Cloud Control Administrator’s Guide. On your site of hundreds or thousands of hosts have you had to patch agents immediately as they get deployed? For this reason I’ve always been a big fan of cloning an agent that has the required plug-ins and all the recommended core agent and plug-in patches, then using that clone for all new agent deployments. With EM 12c this got even easier as you can now clone the agent using the console “Add Host” method. You still have to rely on the EM users to use the clone.The one problem I have with cloning is that you have to have a reference target for each platform that you support. If you have a consolidated environment and only have Linux x64, this may not be a problem. If you are managing a typical data center with a mixture of platforms, it can become quite the maintenance nightmare just to maintain your golden images.You must update golden image agents whenever you get a new patch (generic or platform specific) for the agent or plug-in, and recreate the clone for each platform. Typically, I find people create a clone for their most common platforms, and forget about the rest. That means, maybe 80% of their agents meet their standard patch requirements and plug-ins upon deployment, but the other 20% have to be patched post-deploy, or worse – never get patched! While deployed agents and plug-ins can be patched easily using EM Patches & Updates, but what about the agents still getting deployed or upgraded? Wouldn’t it be nice if they got patched as part of the deployment or upgrade? This article will show you two new features in EM 12.1.0.3 (12cR3) that will help you deploy the most current agent and plug-in versions. Whether you have 100s or 1000s of agents to manage, reducing maintenance and keeping the agents up to date is an important task, and being able to deploy or upgrade to a fully patched agent will save you a lot of time and effort. Do you still maintain a spreadsheet with Database or Server contact or business unit ownership? In Oracle Enterprise Manager 12c (EM) Target Properties allow you to store descriptive target information, such as Contact or Location, which can then be used in dynamic/administration group definition, reports, incident rules and notifications. This blog will show you how you can better leverage the features of EM to store your configuration data and utilize it to the fullest extent. There was a conversation on twitter last week about available patches for Enterprise Manager (EM) 12.1.0.4, and it got a little deeper than 140 characters will allow. I’ve written this blog to give a quick Patching 101 on the types of EM patches you might see and the details around how they can be applied. Now that Enterprise Manager 12cR4 has been out for a little while, more people are getting around to upgrading their agents. Since the monthly Patch bundles were released we already have a few Agent side patches that we want to apply to our newly upgraded agents. I’ve written about simplifying your agent patching before, but this feature still seems to fly under the radar. It’s days like these that I miss running a massive Enterprise Manager with thousands of databases, because this is one of the things that would have made me dance in my cubicle.